Today, NASA will attempt to land its InSight probe on Mars at around 8pm (3:00 pm ET), and you can watch it live right here. After travelling 301,223,981 miles (484,773,006 kilometres) in just 205 days, the Mars Interior Exploration using Seismic Investigations, Geodesy and Heat Transport (InSight) probe is set to enter the Martian atmosphere and make its long-anticipated landing. Assuming a successful landing, InSight will be the first probe in history to drill into the Martian surface. NASA is providing a live feed of the event, with coverage already in progress. We should know the status of the landing shortly after 8pm GMT. Once again, a Mars-bound spacecraft will have to endure the so-called “seven minutes of terror” as InSight screams through the thin Martian atmosphere. Once the descent begins, InSight will dive in heatshield first, and then deploy its parachutes. Towards the end of the descent, the probe will use its retro-rockets to slow down even further, landing on what will hopefully be the smooth surface of Elysium Planitia – a flat plain located just north of the Martian equator. There’s no guarantee, of course, that the descent and landing will work as planned. Mars is notorious for gobbling up our space equipment, the most recent example being the doomed ExoMars Schiaparelli lander, which smashed into the Martian surface at 185 miles per hour (300 km/h) in 2016 owing to a software glitch. The fail-success ratio of missions to Mars is actually quite depressing, with the historic chance of a successful landing being about 40 percent. The thin atmosphere, at just one percent of Earth’s, provides very little friction to slow down incoming spacecraft. Today’s event will be the first NASA Mars landing since the Curiosity rover in 2012. Last minute adjustments are already being made. Early yesterday, mission controllers made a final trajectory correction to guide the spacecraft to within a few miles of the desired entry point. Around two hours before the descent, NASA could further adjust the descent algorithms if deemed necessary. 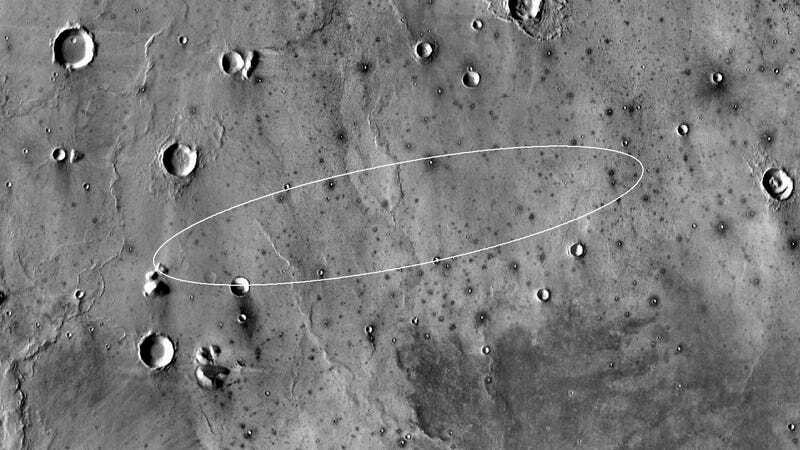 The InSight probe is being trailed by two mini-spacecraft, NASA’s Mars Cube One, or MarCO. These CubeSats – the first ever to be sent into deep space – will attempt to monitor the InSight landing and relay data back to Earth. Should all go well, InSight will spend the next two years (at least) studying the Red Planet’s deep interior. It’ll take about two to three months for InSight’s robotic arm to configure its instruments on the surface, at which time it’ll start digging into the Martian crust. Before then, however, InSight will monitor its new digs and take photographs of the landscape.